Bill Skarsgård, Jaeden Lieberher, Finn Wolfhard et al. DVD: 129 min., Blu-ray: 135 min., 4K Blu-ray: 135 min. Stephen King's horror masterpiece comes to life for a new generation. In Derry, Maine, seven young friends unite against a terrifying supernatural creature that has been haunting their small town for centuries. Calling itself Pennywise the Dancing Clown, IT is a monster of unspeakable power that takes the form of everyone's most horrific fears. Threatened by their worst nightmares, the only way these kids can survive IT is together. Not too sure about IT I was waiting for a cushion clutching horror, instead it seemed more like the goonies meet leatherface, if that was the aim then fair enough. But as an out and out adult horror film, IT was an epic fail. The kids were a bunch of motor mouthed (difficult to hear dialogue) trans pubescents with less common sense than the typical "don't lock the door with the axe murderer in doors" movie cast. They seem to me to be more terrorised by the bunch of town bullies than the clown. Problem here is the age range it was written for can't actually watch it due to the certification. 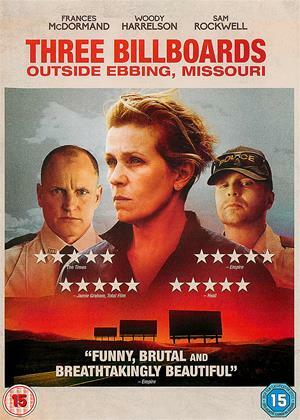 So I've had to give IT a rather sad two stars. 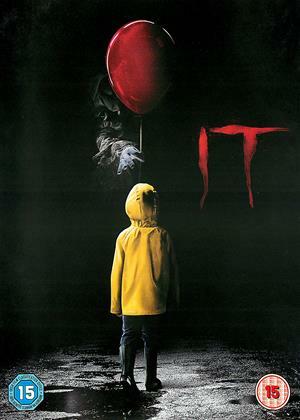 The original was genuinely scary, even if you weren’t scared of clowns. However, this remake is awful and more funny than scary. The young actors are good but that’s it for the positives. Dreadful!! Can believe that I sat watching this to the end! I thought keep going give it a chance but no sorry this absolute rubbish shd be ashamed of themselves, all I can say is actually take the time to read the master piece IT & watch the original far far better & why I don't like clowns!! Pretty average Horror movie, comes in 2 Parts so don't expect a complete ending till you see part 2 . Never rated IT before as a story, This version has Far Better production quality than the made for TV version with Tim Curry but it is still, after all, the same silly story . Every 27 years a whole lot of Kids go missing . why has no one ever bothered to find out why , except for these seven kids ? IT is a Monster that lives under the town in the sewers ,often disguised as Pennywise the Clown but in real appearance looks like a Giant Spider,but we don't see that till part 2 . It feeds on Fear . So expect him to pop up and scare children . but he does very little other than scare them . For a Regular Mass Killer he seems to do very little actual killing in the movie. I stuck it out for 40 minutes and then turned the film off! Unbelievable plot, daft and wasn’t even scary. No idea how people have scored this film and higher. 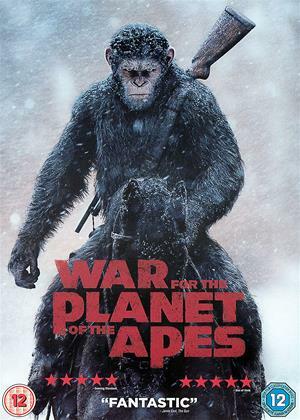 I wasn't expecting much with another remake of an old film. I was pleasantly surprised with this remake. 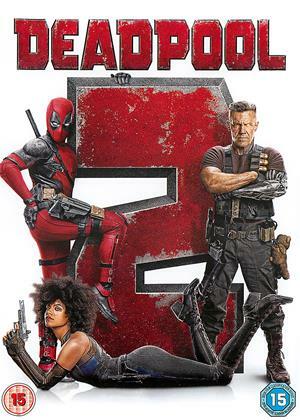 I really enjoyed it and thought they did it well. Hope the next one is more scary though. Difficult to hear dialogue. Not scary - have film makers these days heard of the rule "never show the creature"? When you see the CGI clown and other "horrors" in broad daylight, for the umpteenth time, they're just not scary. Also drags on way too long. Not as bad as some would have you believe. Ok, so it may not be that scary and it relies on too many jump shocks but there's a charm to this version that goes beyond the horror, so if you are wanting the typical terrifying experience you won't find it here. It's a bit like a Spielberg/Amblin movie from the 80's (which it is set in) in tone and appearance, with a hint of Stranger Things thrown in so I found that element quite nostalgic. Bill Skarsgard gives Pennywise a much darker side than we saw Tim Curry give in the TV version and although we do see him a little TOO much of him his performance is impressive. 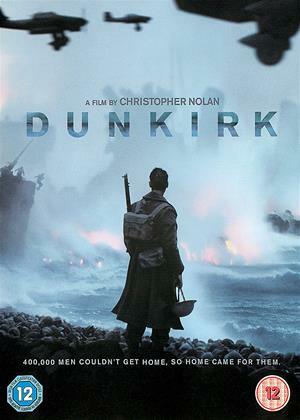 If you've read the book you will no doubt hate this, likewise if you have a love of the TV version you'll inevitably compare the two....but as a standalone modern take on the tale it's worth a view....and I think Sophia Lillis is going to be one to watch out for in the future too!. After a promising start it descended into pure nonsense! I'm afraid I lost my way after 30 minutes. Stephen King deserves better than this. For real horror try 'Salem's Lot' or 'Misery'. Way better than the TV movie this movie will make you jump, laugh and applauding. The kids all did great as did the new Pennywise at times it has a stand by me vibe. There are some films which make you wonder what were they thinking. This is one of those. After a promising start with the clown in the drain where there was real menace, it went downhill rapidly into a "Goonies" farce. It was as scary as Noddy in Toyland. Steven King must be tearing his hair at this travesty of his work. Come to think of it, why didn't he sop them? The clown doesn’t matter. I know the initial criticisms of an It remake was about Pennywise from the initial production photo, but he really doesn’t matter for as notable as Tim Curry made the role in the miniseries based on Stephen King’s novel. He would be important if he was a more notable killer that occupied a horror film where he was the central focus, but he’s not for a movie such as this. It’s all about the pre-teens that have to face their fears. And since these ducks are not picked off in slasher movie fashion, we better like them more than the killer clown. And the good news is that I did like the kids. A lot. The characters are the same, but the setting has shifted to 1989. 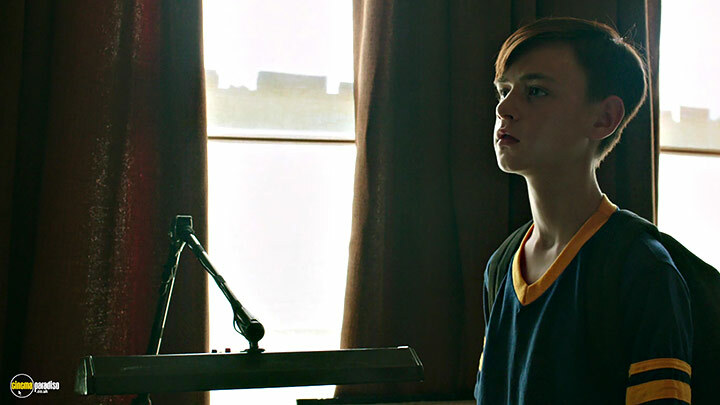 The film begins with the stuttering boy Bill (Jaeden Lieberher) making a sailboat for his little brother Georgie (Jackson Robert Scott). If you’ve watched the miniseries, you know what’s coming next when Georgie throws on the yellow raincoat and venture outside to watch his boat float. 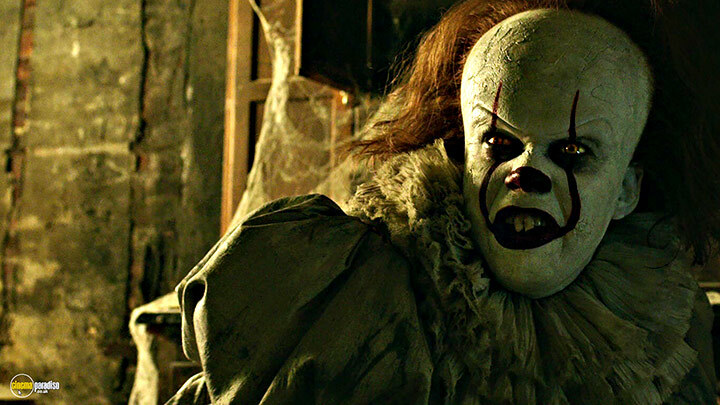 The promotional clip for the film even reveals the scene playing out as we expect with Georgie’s boat going down the sewer drain, Pennywise popping out of the sewer and luring Georgie down with talk of the circus and popcorn. What both the miniseries and the clip doesn’t show you is the moment where Pennywise bites off Georgie’s arm, struggling to get away as Pennywise’s arm stretches to pull him under. It’s at that moment the movie makes itself known as the most unconventionally daring of Stephen King adaptations. 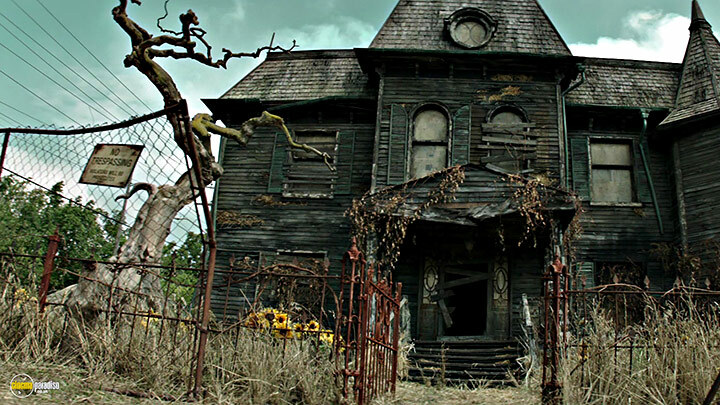 But before director Andy Muschietti races towards the big scares and psychological terrors, he gives the movie enough room to breathe so we can understand and like the kid characters. Most films would glaze over this aspect and phone in the dialogue of how they think kids act, but not Muschietti. We grow to understand and like all of them. Richie (Fred Wolfhard) is a kid who has seen enough movies to master the art of trash-talking that nearly every sentence that comes out of his mouth is hilarious, even it’s a lame attempt to get a smirk. Sam (Wyatt Oleff) is a Jewish boy who is terrified of the painting in his synagogue and prefers not to speak of it. 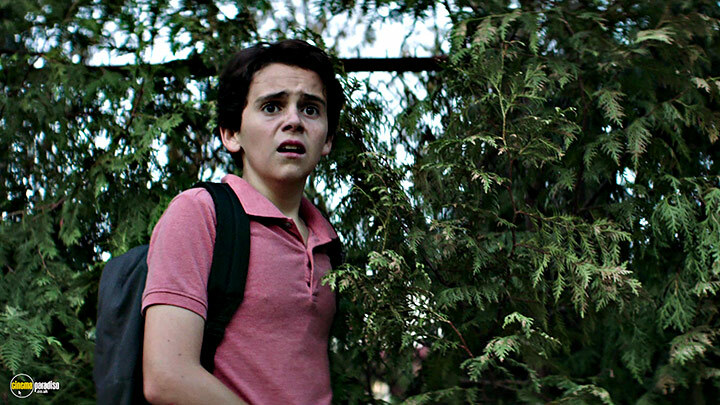 Eddie (Jack Dylan Grazer) is a hypochondriac who is terrified of missing his pill and venturing into sewers. Mike (Chosen Jacobs) works on a farm and has a tragic past of his parents burning to death, still haunted by their deaths. 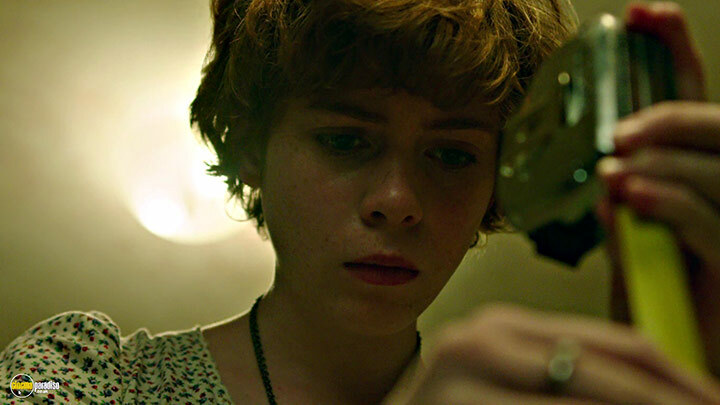 Bev (Sophia Lillis) is the only girl of the group with the worst terrors at home with her abusive father. Ben (Jeremy Ray Taylor) is a tubby kid who is interested in the history of their town of Derry, but is also interested in pursuing a relationship with Bev (and secretly listening to New Kids on the Block). There is so much time spent with these kids just being kids that the movie could have succeeded on a Stand By Me level if it really wanted to. But once the true horror of Pennywise turn visible, it’s surprisingly terrifying. Rather than appearing as a clown to all of them, each character faces their own terror based on their fears. A clown would probably be frightening to Eddie, but not as much as a diseased man that lurches towards him as such a figure seems more real. On the other side of the coin, Sam’s fears manifest as a distorted painting of a woman that doesn’t appear as though it should exist in this dimension. Of course, Bev is already terrified of her father and Pennywise’s tactics shift to the simpler hallucinations of a room flooding with blood. But does Bill Skarsgård make an effective Pennywise clown? For the purposes of this story, he does. He’s terrifying, but never hogs the screen long enough to become too used to him. Skarsgård gives him just enough of a sinister voice, but not large enough to overpower the kid actors or his genuine presence of terror. Another promotional clip features Pennywise possessing a projector and appearing within family slides, but what isn’t shown is the moment when he protrudes from the screen in the actual size of the projected slide. He embodies just enough of a threat to be far more terrifying than just being a creepy clown. I never found clowns all that creepy, but if they contort their bodies to lurch out of a fridge and dislodge their jaw to show teeth, now I’m getting a little spooked. I think what I loved most about It is that it never tried too hard to capitalize on being scary. It’s practically an Amblin adventures the way we follow the kids who search for clues on their bikes and working together when the adults prove to be no help. There’s all the scares of a rollercoaster ride with is daring visuals, but also a psychological element that makes the easy trope of dead kid ghosts more frightening than ever before. For this reason, It is one of King’s strongest adaptations.